Nenten Tsubo’uchi’s haiku group, Sendan, held a Japanese language haibun contest to run parallel with the Genjuan one earlier this year (Judges were NT, SHG, HM and two others). The winning piece, by Haruaki Kato, has now been translated into English by the author himself with help from SHG. We hope you will find reading this recent Japanese haibun both interesting and enjoyable. …. “People say that tuna have to keep on swimming because they’d die if they stopped. I wonder what exactly happens, though, when a tuna dies of old age?” If my wife had not said this to me one day in a low, tired voice, I suppose I wouldn’t have thought about this issue so seriously. …. We had just heard the news about the ‘mass death’ of tuna in a gigantic tank, the main feature of a famous aquarium. They were saying that the cause of death was still under investigation, and that a wide variety of hypotheses— including virus, stress, and even radioactivity— were flying about. For me, to be honest, the cause of the death didn’t really matter: I was shocked by the event itself. It was the simple realization that tuna die, just as we do, that had made me upset. I suppose the word ‘tuna’ had always conjured up to me either the image of a great shoal of them swimming freely across the ocean, or the vision of something being taken out of the freezer ready to be served as delicious sashimi. I had really never thought seriously about how fish passed away. And it was not only fish, but with any kind of wild animal, I’d always supposed they must die in a dramatic incident—being preyed on, perhaps, by a ferocious natural enemy or caught by a brave hunter or fisherman—just like I’d seen in art-house films. …. Yet it is not like that at all. They might actually die, say, of liver disease, or of unfortunate food poisoning, or perhaps by bumping into a rock in an accident. It is simply the ego of humans, who desperately desire a peaceful ending of their own lives, to imagine other animals die in dramatic fashion. And it’s also true that most of us aren’t particularly concerned about the deaths of ordinary, inconspicuous creatures, for whom a dramatic end might seem rather out of place. …. Death is all around us, and countless are the lives being lost at this very moment. The only way for us to survive in this world is to ignore such deaths, just as we do not consider the air as we breathe it in. Only occasionally might we bring to mind a highly dramatic or a deeply peaceful death and be moved thereby. This is rather like whales, still surfacing for air time and again, although their ancestors chose to give up the land for the ocean long ago. We need to think of death sometimes so as not to drown in life’s breathless waters. …. Anyway, that is what I thought to myself as I stood there in a supermarket at the corner of the seafood counter, holding packed shelled oysters which were floating inside their sealed bag filled with water. The oysters appeared to me as if they might be enjoying zero gravity while refusing to ‘belong’ to either life or death. They seemed so calm in the airless tension. …. When I looked up from my reverie, my wife was already in front of the meat counter far ahead. I put the packed spacewalking oysters back onto the counter, and weaved my way over to her through the crowds. Compared with last year’s Autumn Haike–-a four-day muscle-straining event on and around Mt. Tsubakurodake in Nagano–-this year’s, held on October 31st, was a low-key affair, and a very pleasant one at that: a day’s climb up and down Mt. Bunagatake, one of Japan’s 二百名山 (200 Famous Mountains). Its popular trail begins about an hour’s drive to the northeast of Kyoto city. Following some last-minute cancellations and adjustments, we find ourselves a party of nine, arriving from different directions (Kyoto, Osaka and Shiga) huddled, respectively, into three vehicles. Five of us travel in a van: Stephen (driver), his wife Kazue, Richard Donovan, Kumiko and myself. At about 9:40 we pull into the car park, nestled in the gorgeous Hosonogawa valley. We seem to be the last to get here and are promptly told the car park is full! Stephen gives it a try anyway, and after some wheeling around the lot, he spots a narrow opening between two SUV’s. The van just fits! We put on our hiking gear, double-check the contents of rucksacks, adjust the length of trekking poles, take a sip of water for luck. As promised, Stephen lends me his wooden stick, and, for the day at least, I fancy myself a wandering Bashō. Before starting the ascent, we walk past some pretty wooden houses. A woman is washing daikon radishes in a clear stream. We proceed over a red wooden bridge and past some maple trees beginning to turn orange. The path is suddenly constricted by the low buildings of Myōō-in temple. Here, there is a water-basin (chōzubachi), enveloped in moss, and a moss-capped lantern (ishidōrō). Under an eave of the main sanctuary hangs a massive hornets’ nest no one dares approach. Some of our hikers are already moving up the hill, so the rest of us try to catch up, only to realize this mountain is not to be taken lightly! It takes most of us two hours of trekking through dense woodland to reach the top of Gotenyama. Here, at long last, we are able to appreciate panoramic views. Five of our entourage choose to remain here, while the ‘shifters’ trek on towards Mt. Bunagatake’s crest. I stay with the ‘loungers’, blaming my untrained legs. We savour lunch packs as rays of sunshine warm our wind-thumped backs. 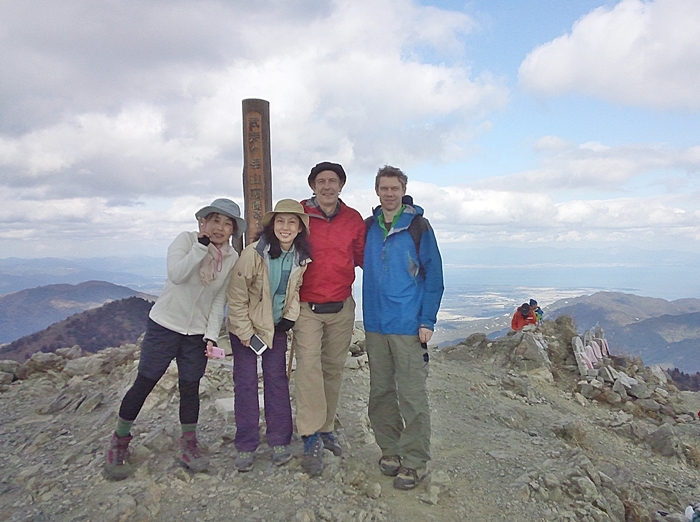 On their return from Bunagatake peak, the ‘shifters’ tell us of a 360-degree vista which included the vast blue expanse of Lake Biwa. They have even witnessed the celebrity, Youki Tanaka, summitting, together with a camera crew, no. 184 of the 200 Famous Mounts he is running up. The descent–often the more perilous part of tackling a mountain–shows us the world in a rather different light. We notice photos of a hiker gone missing a week or two ago pinned here and there along the trail. He’s probably in his late fifties, and his face looks grim. What on earth could have happened to him? Apart from minor slips, the descent goes smoothly… and, one by one, all of us reach the valley floor in one piece. As the sun sinks behind the western mountain ridge, the temperature suddenly drops. At Chizuru’s recommendation, we drive off to a restaurant in Katata: an opportunity to revitalize and share some of the day’s haiku. On the way back home, winding along the pitch-black mountain roads, some of us remember ghost stories. Just ask Kazue. She will surely tell you a spine-chilling one!